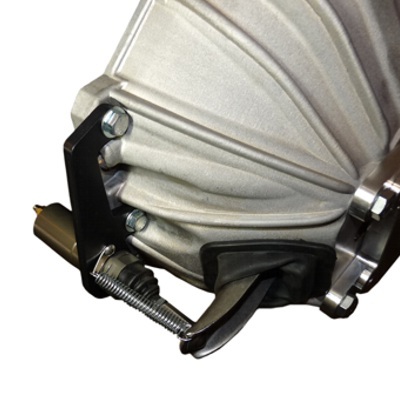 Hydraulic clutch release systems have gained wide acceptance in the aftermarket as a keen solution to both engine conversion and stock clutch linkage replacement scenarios. 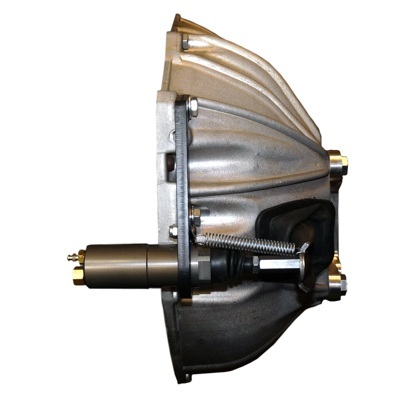 Novak's Hydraulic Clutch Slave Retrofit has evolved into its best rendition, as our #HCRA. It bolts to the popular AMC I6 & V8 style bellhousings on 232, 258, 4.0L, 304, 360 & 401 engines. 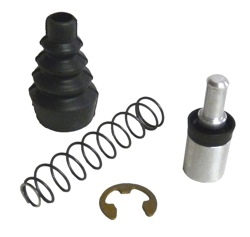 This kit will work with conversion or factory transmissions. Our #HCRA clutch kit has been engineered to bolt to most AMC style bellhousings and to work with their associated pressure plates. All included components work as a system to insure a straightforward installation. The arm provides the proper ratio for the great majority of pressure plates and the T6 hardened and hard anodized billet aluminum slave cylinder and piston are absolutely durable, yet rebuildable or replaceable down the road, if necessary. Hydraulic clutch release systems are typically engineered to have a 1:1, master-to-slave ratio, where the leverage is not obtained through differential hydraulics. 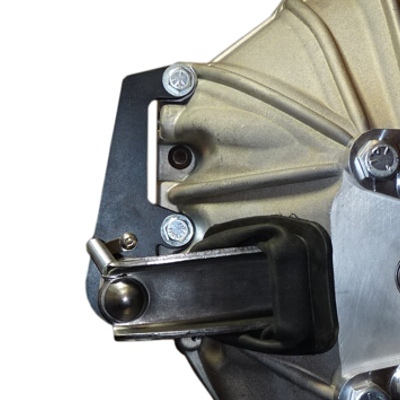 The force is obtained through the leverage provided by the clutch pedal and then the release arm / fork at the throwout bearing, like a conventional mechanical clutch - the method of transmitting the force is the only difference. These principles are discussed here. As such, the installer will generally choose between our 3/4" bore version or our 7/8" bore version to best match the diameter of their master cylinder. Choosing a larger slave for a smaller master may create a situation where the pedal pressure is reduce, but the lessened travel may not fully release a clutch. Choosing a smaller slave for a larger master may create a situation where there is excessive pedal pressure. However, the Novak 3/4" bore slave has more travel than OEM units and typically work with 7/8" master cylinders without blowing out. This is helpful if the throwout bearing needs more travel for release, but note that this is not a substitute for not choosing the right length throwout bearing. Keep in mind these ratios are based on the area of the bores, not the diameter so, πr2 to calculate either master or slave area. Small changes in the bore size can yield a large change in distance or force. 3/4” bore yields .442 sq. in. whereas the 7/8” is .601 sq. in. Travel is a linear function of the area x the distance equals volume. The volume of fluid moved is the key and the same on either end no matter what changes are made so long as the system is sealed and no air is present. For your best benefit, read and understand the principles of working with hydraulic clutch release systems and determine the applicability for your vehicle. 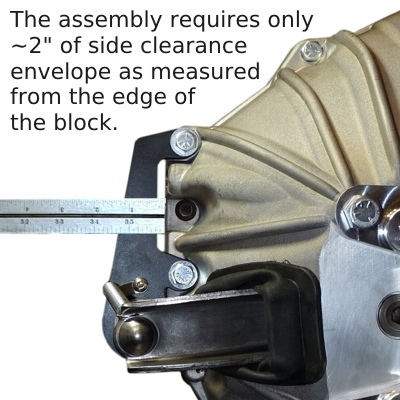 * Note that Full Size Jeeps (Wagoneer, Cherokee, J Truck) vehicles do not accommodate conventional, firewall mounted master cylinders due to the brake booster and the electrical bulkhead connector. If converting one of these Jeeps to hydraulic clutch release, the installer will need to custom configure a master cylinder accordingly. 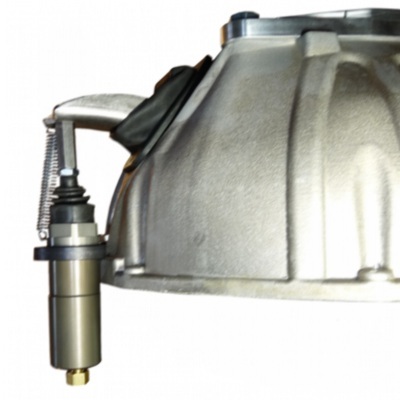 The HCRA has been proven to work on all known clutches for AMC engines. 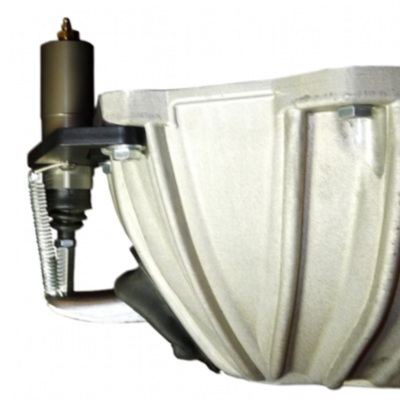 Aftermarket bellhousings such as Lakewood, McLeod and others have thus far proven compatible with this system. Some AMC bellhousings feature bosses to mount a factory style slave cylinder. These cylinders are limited to the 7/8" bores and additionally, we've seen their prices rise and availability fall. 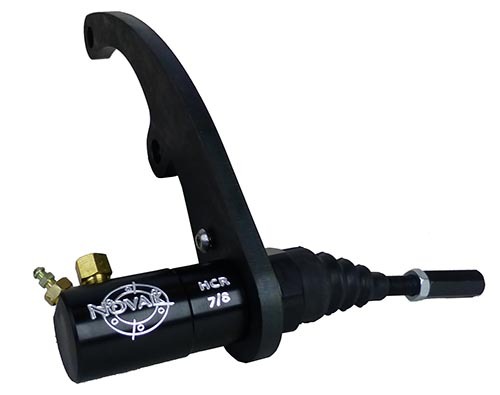 The Novak kit will work across the variety of bellhousings, and allow for use with the more popular 3/4" master cylinders, provide adjustability and ongoing availability and support. Since this slave cylinder assembly mounts on the driver's side, it may be in proximity to the front driveshaft on Wrangler. If your Wrangler has factory springs that have sagged some, a risk of interference exists here. We have seen good clearance on Jeeps with good factory and, of course, lifted spring sets. Shown below is the Chevy version of this kit. The AMC version is very similar in appearance and specs. 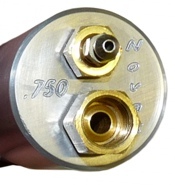 Our slave cylinder uses a highly standard 1/4 DOT fitting. This is the female 7/16-24 threaded fitting ready for an SAE, male double-flare fitting. Most installers that have done any work with brake lines will be very familiar with these, as will their local parts supplier. For the easiest installation and the most professional look, we recommend our braided stainless steel and poly wrapped flex hose and line assembly (right). It features a flareless compression coupling that can accept the provided straight, 90 degree or 180 degree pre-bent lines. Or the installer can bend the provided straight line to best match their situation. This line is ~3' in length. These useful adapter fittings permit the adaptation of our #HCRC to 1991-present Jeep master cylinders that use the O-ring style fittings. These fittings each feature a male 1/4" DOT threaded ends so that the installer can use or make standard hydraulic lines or hoses for the particular situation. The tip inserts into your 1991-1995 Jeep YJ (and 1991-1996 Jeep XJ) or 1997-present Jeep TJ & XJ master cylinder using the factory style O-ring and retaining pin. We recommend that you verify your particular fitting with the image and descriptions below prior to ordering. Note that 1980-1986 CJ's and 1987-1990 YJ's master & slave cylinders already feature a female DOT fitting and do not require these adapter fittings. 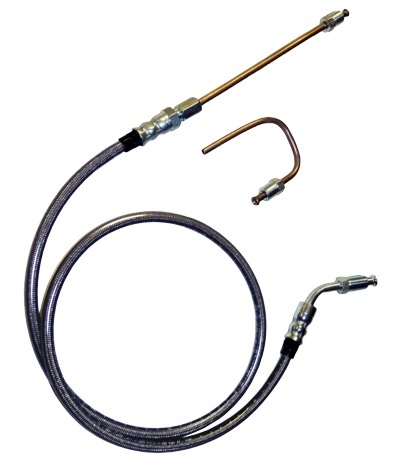 A common example of hydraulic hose / line use of these adapters when installing the #HCRC kit is to buy or fabricate a line with a female DOT 1/4 fitting for the adapter/master side of the circuit. This line should then feature a male DOT 1/4 end for the slave side of the #HCRC cylinder port. While sometimes not needed in this application, it is priceless when clearances dictate its use. With all the variabilities in flywheel and clutch height, we highly recommend its use. Further information is here. Installation instructions are included. If you have an existing hydraulic master cylinder, installation is very straightforward. If retrofitting the master things can get more challenging. Later CJ models are marked with the correct location on your firewall (at least the 80s era). Older versions, especially if you have floor mount pedals will need to get more creative. Wilwood and other manufactures have some very nice options available. Make sure that the master cylinder travel will be about 1-1/2”. 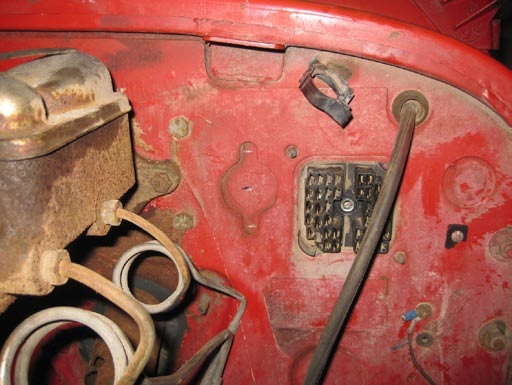 It is also possible to retrofit the pedal assembly from a later Jeep (87-90 YJ models would be a prime candidate if you choose to go that way). The clutch article listed below is extensive and highly recommended reading.